FIFA 14 has already launched for PC, Xbox 360 and PlayStation 3, but this month we will be able to play this football simulator on the next generation of consoles. 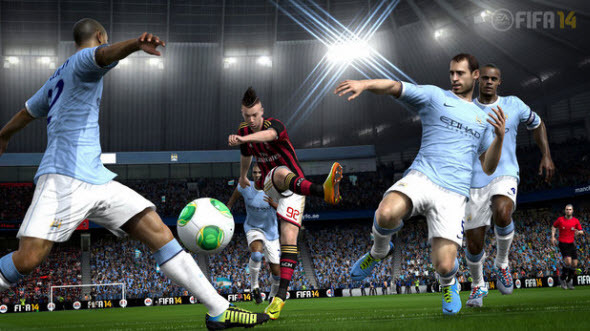 FIFA 14 Xbox One and PS4 versions will get extremely realistic graphics and several interesting features that have been detailed in the new trailer. In the new video the developers have told more about the abilities of the next-gen consoles and Ignite - the game engine of FIFA 14. With Ignite and the power of Xbox One and PS4, the developers are able to use much more memory than before. That's why they have decided to expand the quantity of the animations that are presented in the football simulator. Now you will be able to make much more interesting passes and kicks, and, moreover, you will see various animations for them all on the screen. Another exciting feature that will be implemented in FIFA 14 Xbox One and PS4 versions is In-Air Play. It allows you to jump and do lots of headers. What is more, for the first time in the series the players will be able to adjust the angle, direction and strength of the headers. FIFA 14 Xbox One version will be released on the 22nd of November. The game for PS4 will hit the stores on the 15th of November in North America and on the 29th of November in Europe.